Seems like the latest trend around the cooking blogs these days is cooking with quinoa. Nevermind it took me a good 3 months to say “quinoa” properly, trying to figure out how to cook with it in a way that suits my taste was a bit of a challenge. And to be honest, I’m still working on it. 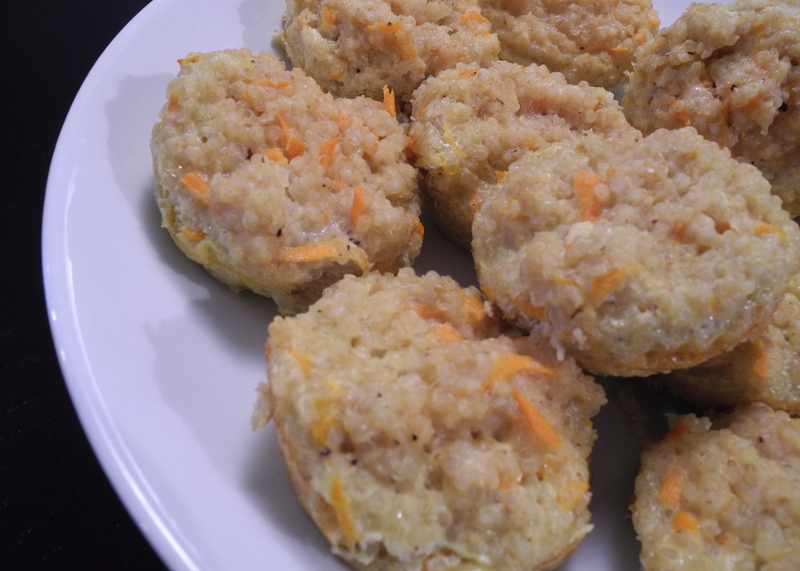 In the meantime, I came across a recipe on Pinterest for “cheesy quinoa bites” and liked what I saw. I’ve made these a few times now and my husband loves them. Simone is lukewarm, but that’s not bad given it’s a little unusual at first. The original source of this recipe can be found here on the blog, “So Very Blessed”. 1/2 cup uncooked quinoa (you can cook it like pasta in a pot of boiling water, then strain it once it’s translucent and “sprouted”; or do a 2:1 ratio of water to quinoa). Pre-heat oven to 350 degrees. Grease a muffin tin and set aside. Cook quinoa and once cooled, mix together with all of the above ingredients. You may have to adjust some of the proportions so that this is runny enough to be poured into the muffin cups; you don’t want this to be too runny (eg. not enough quinoa) or too solid (too much quinoa not enough egg). I had to play around with the portions the first few times to get something I was satisfied with. I use my egg whites (in a carton from grocery store) to help me adjust the liquid portion of the recipe. Pour into muffin cups so they are approx 1/2 to 3/4 full. Bake for 15-20 minutes. Pop out of muffin tin and serve with some delicious Frank’s hot sauce. YUM!